Kapha’s oily nature can be brought into balance by including dry foods into your daily diet. Foods that are light and nourishing are the right choice for the heaviness of this dosha. Warming food that is well-spiced to calm the sweet, cold quality of Kapha will help regulate your moisture levels by sustaining heat. Here are some specific dietary tips for Kapha dosha meals. Kapha is heavy, cool, sweet and moist, so what you eat should be such that it counterbalances these qualities. Lightness is the perfect foil to Kapha’s heaviness. This light quality is based on both the absolute weight of a particular food as well as its density. Fruits and vegetables embody the qualities of lightness, so a diet that’s packed with these, preferably cooked, is a good way to go. You can also enjoy raw fruits and salads in moderation, especially during spring-summer. Switch coffee with green or black tea as these are lighter. Your constitution should avoid heavy foods like hard cheeses, puddings, nuts, cakes, pies, wheat, most flours, breads, pastas, red meat and deep fried foods. You must also take care to eat smaller portions and avoid eating very heavy meals. A good way to gauge how much you should be eating is to fill the stomach a third full of food, a third of liquid, and leave a third empty for good digestion. Kaphas should avoid overly heavy or highly processed foods as they can heighten heaviness. 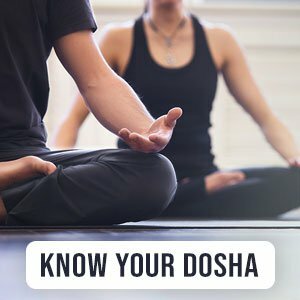 Your doshic type benefits from the warm quality which can be obtained from eating foods that are warm in temperature or those that have a heating essence (like spices). Cooked food is preferable as it is warming and usually easier to digest – especially during fall-winter. Kapha-dominant people should drink hot beverages and keep sipping on warm water throughout the day, with a spot of raw honey in it if possible. Honey has warming and detoxifying powers. Likewise, you would do best to stay away from foods with a cooling essence, cold drinks and frozen foods, and even refrigerated leftovers. These foodstuffs inherently intensify their cold quality, even when they are served hot. Dry foods like cereals, beans, white potatoes, dried fruits, rice cakes, salt-free crackers, popcorn or even an occasional glass or dry red/white wine will offset the oily nature of Kapha. Similarly, minimize the use of oil in your cooking. Oily foods like avocado, coconut, olives, buttermilk, cheese, eggs, cow’s milk, wheat, nuts and seeds are a no-no for this dosha. Another thing for Kaphic people to watch for is their fluid intake. As you have the tendency to retain water, you should only drink what your body requires, in accordance with your climate and activity level. Your constitution will also benefit from passing up moist foods like melons, summer squash, zucchini and yogurt. Fruits and vegetables are called roughage with good reason; their fibrous texture gives them a rough quality that’s good for Kaphas. This is why you should eat a lot of fresh produce. But, cooking these foods makes them much easier to digest. Be warned that it is not always advisable to take the raw route and let the seasons be your guide. The roughness of broccoli, cabbage, cauliflower, dark leafy greens, and many beans are the perfect way to counter Kapha’s smooth, oily nature. You need to watch for foods that are smooth in texture like bananas, rice pudding, hot cereal, milk, cheese and the like, as they can intensify mucus production. The three Ayurvedic tastes that help balance Kapha are pungent, bitter and astringent. A Kapha-pacifying diet will mean eating less of the salty, sweet and sour tastes. This taste indicates the spicy, hot flavor found in chilies, radishes, turnips, raw onions and most spices. The light, hot, rough and dry qualities of this taste are beneficial to your doshic type. If you enjoy spicy food, go all out. If you don’t prefer your food too hot, milder spices like cardamom, cloves, cinnamon, cumin, ginger, garlic, paprika and turmeric will work well too. This taste refreshes the palate and sharpens the senses. It fuels digestion and cleans the channels of the body, stimulates sweating and works as a blood thinner. This is the taste that comes in the form of bitter greens (like kale, dandelion greens, collard greens, etc.) or foods like bitter melon, Jerusalem artichokes, burdock root, eggplant and chocolate. Being cooling, rough, drying and light, the bitter taste will benefit this dosha. However, since it is cooling, you must add heating spices to it. This taste cleanses the palate and boosts the sense of taste. It tones the skin and muscles, helps digestion and increases appetite. This taste feels behind a rough, dry feeling in the mouth – imagine sipping a strong black coffee. The astringent taste is found in legumes (such as beans and lentils), fruits (including cranberries, pomegranates, pears, and dried fruit), vegetables (such as, broccoli, cauliflower, artichoke, asparagus and turnip), grains (such as rye, buckwheat, and quinoa), spices and herbs (including turmeric and marjoram), coffee and tea. Kaphas will find this taste beneficial for its ability to tone tissues and absorb fluids better. This taste can bring out the worse in Kaphas by way of heaviness, weight gain, sluggishness and sleepiness. It can also create excess mucus, aggravate colds and coughs, and dampen the digestive fire. You should not consume foods that are naturally sweet like fruits, most grains, root vegetables, milk, ghee, yogurt, eggs, nuts, seeds, most oils, and Kapha-aggravating meats like chicken, duck and beef. Take care not to consume refined sugar or sugary sweet foods. Cut back on sour foods like fermented foods, vinegar, hard cheeses, sour cream, green grapes, citrus fruits and alcohol. The hot, light and oily essence of sour foods can disturb your constitution. You may feel extreme thirst, cause droopiness of the eyes, increase feelings of fatigue and worsen swelling or water retention. If you would like to enjoy the sour taste, a squeeze of cooling lime juice on your salads is the way to go. This taste is mainly a derivative of salt itself. Quite like the sour taste, the moist and oily qualities of salty foods aggravate this dosha. Salty food can cause water retention, high blood pressure, GI tract inflammation, ascites, grey hair, wrinkles, excessive thirst, and obstruct the senses. On an emotional level, it can trigger greed.